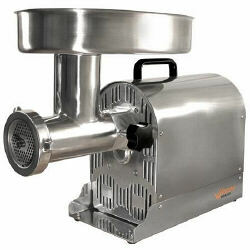 Top of the line meat grinder for commercial or home use. Strong and tough for everyday use with the features and quality construction to last a lifetime. Featuring a powerful 1125 watt, 1.5 HP. permanently lubricated air cooled motor that easily grinds 12-18 lbs. per minute and an extra large oval, stainless steel hopper so you'll be able to tackle large jobs and the toughest cuts of meat. Included with the grinder is a Stomper, 2 Grinding Plates, Stainless Steel Cutting Knife, Stuffing Star, 3 Stuffing Funnels, Funnel Flange, 10mm Snack Stick Funnel and the Cyclone Auger to stuff sausage with incredible efficiency. A great assortment of optional accessories and plates adds versatility to this grinder. to this grinder. Dimensions: 16.8 x 24.8 x 15.4"